Sunday's shock referendum result, which confounded pollsters and was a political disaster for Santos, plunged the country into uncertainty over the future of the Revolutionary Armed Forces of Colombia (FARC) rebels, who had been expected to disarm once the deal was passed by voters. 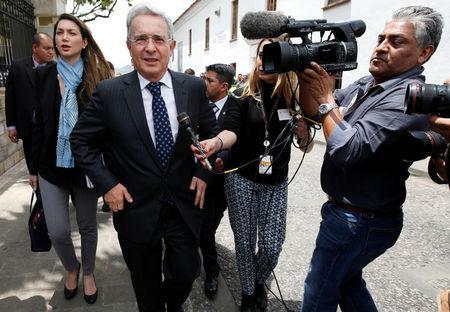 After more than three hours of talks, former President Uribe emphasized the need for "adjustments and proposals" to ensure the deal includes all Colombians. Uribe, a former lawyer and cattle rancher, opposed Santos' peace talks from the start and said the final deal, which was reached in August after four years of painstaking negotiations in Havana, gave too many concessions to the rebels. He spearheaded the "no" campaign, urging Colombians not to approve the accord, which would have given the FARC guaranteed congressional seats and immunity from traditional jail sentences. "No" carried the day by less than half a percentage point. The future of the deal seems to hang on whether the FARC will accept tougher conditions for demobilization, perhaps combined with a softening of Uribe's hard-line demands. Government negotiators are in Havana to confer with guerrilla commanders who have said they will remain "faithful" to the accord. Thousands, many wearing white, marched in cities across the country in support of the deal on Wednesday. Members of Santos' cabinet joined marchers in Bogota's main square. "They have made it clear they want the peace process to continue and they want to negotiate a settlement," the official, who met with both sides, told reporters.